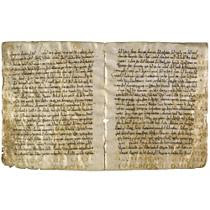 One of our readers found the relevant webpage at Sotheby's with description and images of Codex Climaci Rescriptus. 2. Subsequently, the manuscript appears to have passed to one of the early monasteries of the Sinai Peninsula or the north-west of mainland Egypt, most probably that of St. Catherine's, Sinai (built by the Emperor Justinian I between 527 and 565). Moir states in his edition of the Greek section of the palimpsest states, "I feel certain that this manuscript was there [St. Catherine's] in the course of its travels" (1956, p. 4). It may have been carried by Christian refugees fleeing from the Arab advance in the seventh century. The ancient and venerable library of St. Catherine's has preserved a significant amount of Christian Palestinian Aramaic material, including the only other sixth-century manuscript in the language to survive, the Codex sinaiticus Zosimi rescriptus (a palimpsest manuscript whose colophon identifies its copyist as a monk of Sinai and dates his work to 979; it is now scattered and divided in ownership between The National Library of Russia, St. Petersberg; the Niedersächsische Staats- und Universtätsbibliothek, Göttingen; and the Schøyen collection, London & Oslo), as well as some further small fragments of Christian Palestinian Aramaic, which are also mostly palimpsest (see Müller-Kessler & Sokoloff, 1998, p. 3 & S. Brock, Catalogue of Syriac Fragments (new finds) in the library of the Monastery of Saint Catherine, Mount Sinai, 1995). It appears that at some time in the distant past St. Catherine's took into their library a sizeable parcel of books written in that language, which some centuries later, having become outdated and perhaps unreadable, were set aside and their vellum reused. 3. Acquired by the pioneering Biblical scholars and twins, Agnes Smith Lewis (1843-1926) and Margaret Dunlop Gibson (1843-1920) in three stages between 1895 and 1906 (all in the vicinity of Cairo, the manuscript having presumably been 'liberated' from its monastic home in order to supply leaves for the antiquity trade there). They were staunch Scottish Presbyterians with a consuming interest in the early versions of the Bible, and a profound belief in female-education, in an age when it practically did not exist. They used their own fortune to become celebrated scholars in the fields of Greek, Latin, Hebrew and Syriac, and, thrilled by Tischendorf's discoveries at Sinai, they set off to St. Catherine's on a 'manuscript-hunting' expedition in 1892. They won over the difficult patriarch, partly through their insistence that nothing was to be abstracted from the library there, but only photographs taken; and on that expedition they returned with pictures of the Syriac manuscript which would make them famous, the fourth-century Syriac Sinaiticus (their lives and its discovery are the subject of a recent book, J. Soskice, Sisters of Sinai, 2009, which was adapted for BBC Radio 4 this April). Having returned home to Cambridge they were tipped off by a mysterious informant that spectacular manuscripts were to be had through various dealers in Cairo. This was quite different from the questionable removal of manuscripts from ancient libraries, and the twins regarded it as a rescue mission, returning to Egypt and acquiring a single leaf of the present codex (now fol. 24; published by them in Studia Sinaitica 6, p. cxxxix) in 1895. They acquired a further 89 leaves from the present manuscript in October 1905, and in April of the following year, while passing through Port Tewfik, Agnes Lewis bought two palimpsest-manuscripts on a whim. Upon returning home she discovered that one contained another 48 leaves of the present manuscript, and that the two portions were separated by only a single leaf – that which the twins had acquired first in 1895. They published the entire text in 1909. Only one other leaf of this scattered manuscript has emerged in the last century: in a collection of palimpsest fragments sold by Eric von Scherling to the collector Dr. A. Mingana, now in Selly Oak, Birmingham: his Syriac MS. 637 (the fragment contains Acts 21:14-26 in its underscript, and should attach to fol. 131 here; Rotulus 5, 1949; Catalogue of the Mingana Collection of Manuscripts, 1939, III: xxv & Bulletin John Rylands Libr. 23 April 1939, pp. 201-14). On the death of the twins the manuscript was left to Westminster College, Cambridge. 1. Was it purchased in Cairo or discovered at Sinai? 2. Does it contain only the gospels or also portions of the LXX? Well, we now have the first question answered: apparently both. For the second question, it's a bit of a mystery from the extensive description just what's in the underwriting vis-a-vis the overwriting. It looks like Greek to me, so I'm guessing the answer to #2 is B. But then again, it might be Yes. Rather shocking to see that Westminster College, a college associated to the University of Cambridge, is canibalizing its library in such a way. I would think that they owe it to their benefactors, the sisters Lewis and Gibson, to take care properly of what has been entrusted to them. A heritage like theirs comes with responsibilities. And surely there are other means to get money for a renovation project (or whatever it is they need money for). The college serves the United Reformed Church; if every member of this Church donates 5 pounds to their college, they will bring together the same amount of money. Codex Climaci Rescriptus is an important witness to the Greek text of the Gospels (Uncial 0250 according to the Gregory-Aland numbering) as well as an absolutely unique witness to the Christian Palestian Aramaic Old and New Testament versions from the early period (6th century). This kind of codex should remain accessible to scholars, as it is a key resource for students of the text of the Bible as well as linguists. Now it is possible that it will be bought by a decent institution, but it is equally well thinkabe that some rich guy buys it as a nice piece of decoration or simply as an investment. In other words: access to this codex is no longer guaranteed. I think biblical scholars as well as specialists in Aramaic and Syriac should not hesitate to voice their concern over this sale, for instance through the contact form on the college's website http://www.westminster.cam.ac.uk/index.php/contact-us, which allows one to write messages to the Principal. Wikip. & the Sotheby's cataloge say that CCR 2 has a passage of G. John along with epistles (Paul & Catholics). BUT the Sotheby's list says "I John 1:1-9", listing it as 136v. 136r is 2 Peter 3:16-18. Hence I suggest that there is no GOSPEL reading here, but it is I Epistle of John. I wrote to Sotheby's about this. Can anyone access this ms & check? Hebrews 6:9: Future or Present?